Dream Big for the New Year: A Story of Success. Never Give Up! 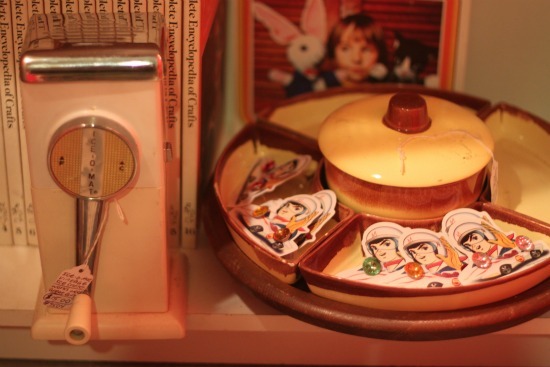 Photographs from my favorite flea market taken the week I left my day job. While living alone again and adjusting... I accomplished many difficult tasks flying solo. Each heavy box or piece of furniture lifted, a diminutive victory. My home is truly my own. 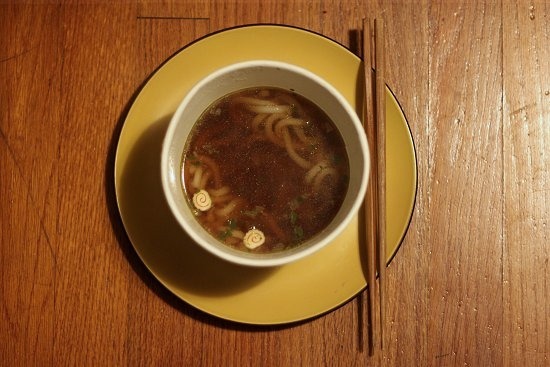 I visited Philadelphia, Las Vegas, Key West, and Okinawa, Japan for the first time... and returned home each time revitalized and ready to create-up a storm. I Bought Nothing New For One Year... I learned a lot, and enjoyed the challenge! I announced I was going to start my own vintage boutique here in Jacksonville, Florida... and a longtime follower of my work boldly offered a large cash donation to help me start the shop! Heartbreaks, financial troubles, personal failures, they collaborate to drag us down. My heart was shattered this year, but I never stopped working, growing, and creating. It's paying off. Every time I check my inbox I have a new opportunity, I'm building a trailblazing brick and mortar shop with artists I've admired for years, and I've made a soul-to-soul connection with you, my reader! The sleepless nights you put into your dreams will pay off. It doesn't happen overnight, but success always comes to those who never stop putting every ounce of their energy into reaching their goals. Things get better when you never give up. I promise. 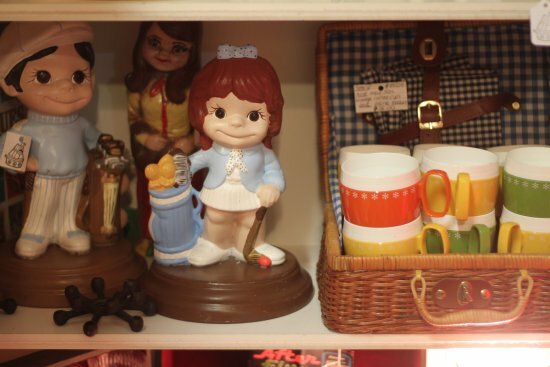 It's been both fun and exhausting, to occupy my own clandestine cubbyhole in Jacksonville, Florida's popular Southern Crossing Antique Mall this year. I've exhaustively documented my progress, sales, and the lessons this space has taught me along the way. 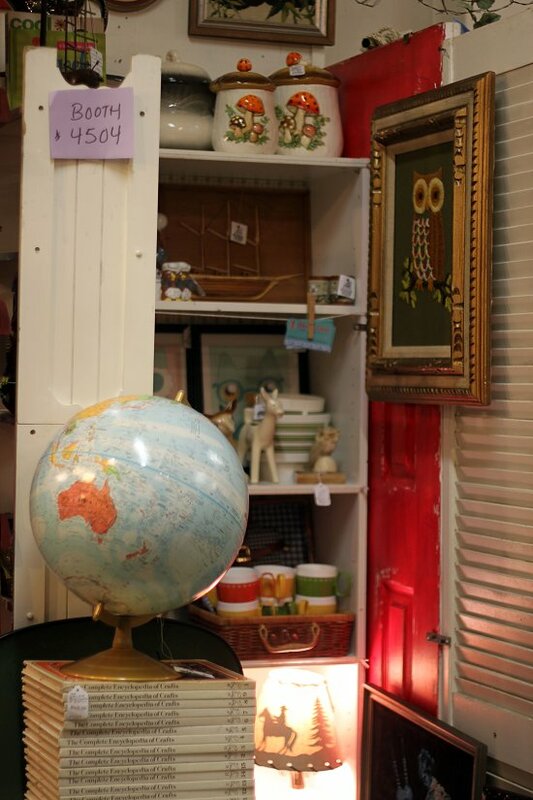 Goals for my Antique Store Space in 2012: Bigger, Badder, Better! 1. Re-Brand the Space; Make it More Thirft Core: I'm going to complete a sign, change the look of my space, and work on curating the merchandise to tell the Thrift Core "story." 2. New Merchandise Schedule: I'm going to exchange all of the merchandise bi-weekly and switch the vintage goodies around weekly to keep the booth fresh. 3. Become More Analytical: I'm going to document what I spent on merchandise and critically analyze sales trends. I'm looking forward to spending more time in the antique store in 2012. I may not continue to share every single sale, but I will continue to share my findings and helpful tips for success every month. I'll fill you in with how the changes above work for me, too. So tell me, what are your goals to improve reselling efforts for 2012? 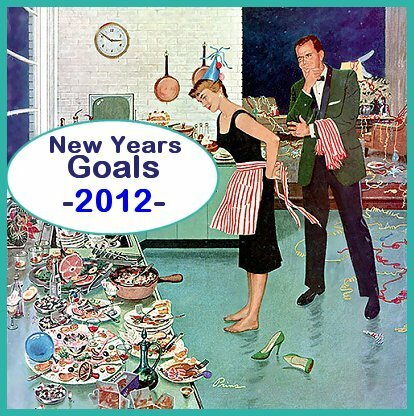 Tag, You're It: I tagged you last year, and now I'm inviting you to share your Top 3 Goals for 2012 yet again. Use the button/code below on your blog to join in. Copy + Paste the code below into your blog post to display the button. 1) List your top goals for the New Year. Keep it realistic! 2) Write real action steps to achieve your goals! I will pedantically track every cent I spend and earn. I will ONLY buy 2nd hand. (With obvious exceptions, like food.) I'll only buy the best vintage finds. If I buy one new thing, one old thing goes out! I'll contiue to sell & donate items at home, too. Join the fun: What are your New Years Goals? Comment with a link to your New Years resolution posts, let's inspire each other! I always look forward to a New Year and the proverbial fresh slate it offers. The Random.org number generator has spoken! 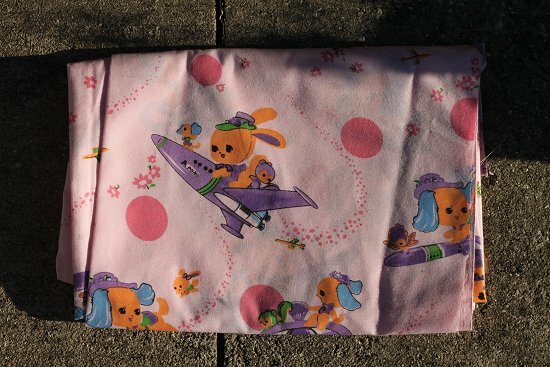 This time the Kawaii Giveaway winner is Commenter #39, saavylistener. I've sent you an e-mail! Thank you everyone for entering and for providing the valuable feedback. There will be another giveaway up next week. 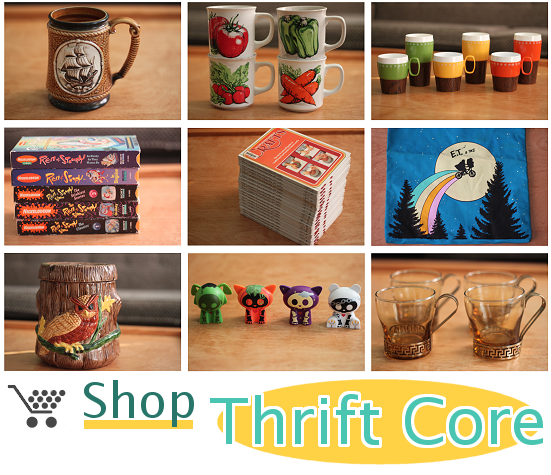 Wanna Sponsor Thrift Core? It's time to plan for the new year! I'm accepting sponsors for January 2012. If you want to place an ad on Thrift Core or host a giveaway simply drop me a line. 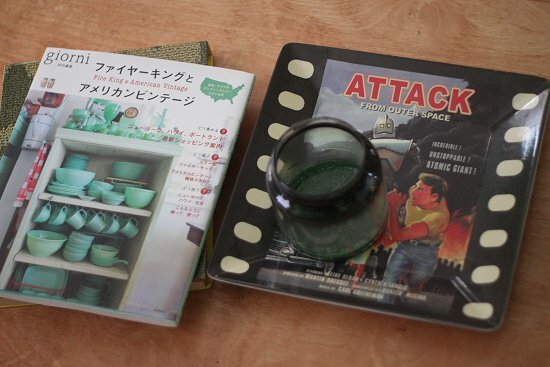 Thrift Haul: Attack From Outerspace! And Other Retro Goodies. 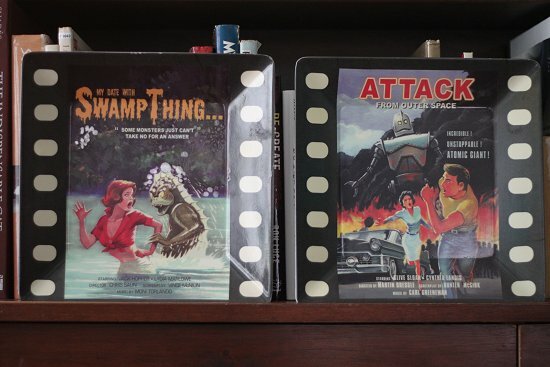 I paid $1.00 for two Horror Movie Poster novelty plates. I love how the Attack From Outer Space retro space monster looks like the robot from The Iron Giant, an underrated animated classic. I'm going to put them in my antique store booth soon, but I wouldn't mind keeping them. 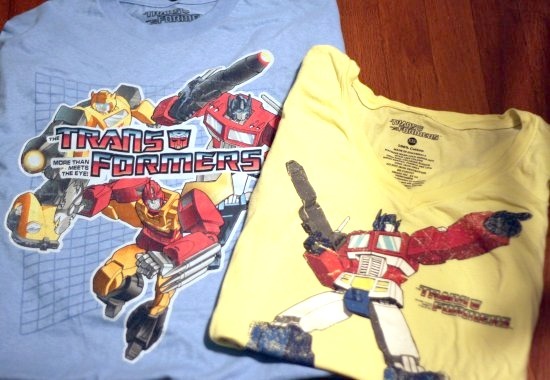 Too bad I can't pair them up with fun retro tin robots. I've never found an authentic vintage robot toy in all of my explorations! 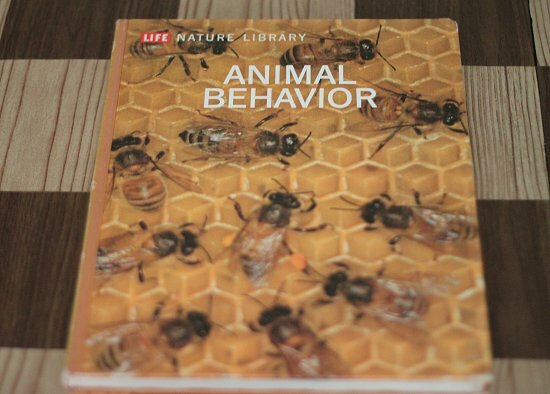 I paid 50 cents for this book, part of a set I've been slowly collecting. These books have gorgeous illustrations and photography, I'll have to document them further in a future post. 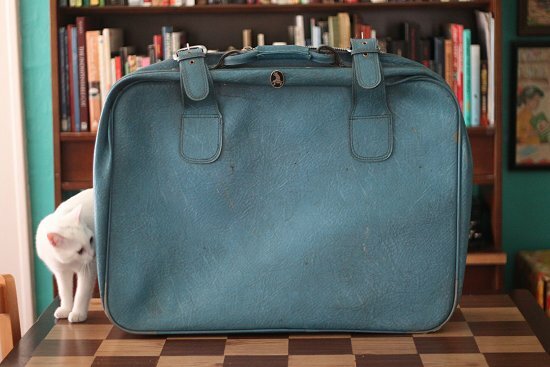 And another fifty cent find was this huge vintage Mercury suitcase. The inside is pristine, but the outside will need a lot of cleaning up before I put it in the shop. a couple more goodies from Puerto Rico! My dad bought me back a carnival mask from the city where he's from, Ponce, and my aunt bought me the colorful top pictured. The mask appears to be Yuko-kitty-approved! A Very Thrift Core Christmas: Robots, Dinosaurs, and Toys. Oh my! 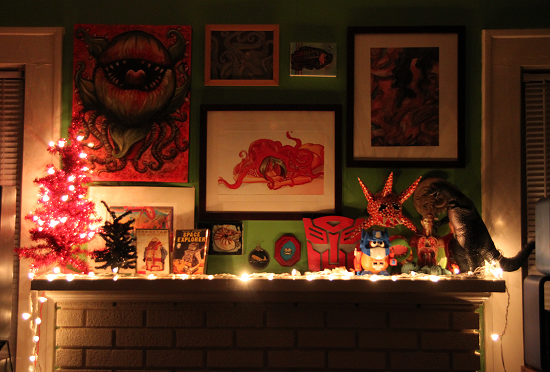 I carved a truly Thrift Core-style Holiday tableau in my living room. The whimsical Christmas trees and shining lights were free, with the red tree being a trash-find. The string lights cast a soothing glow in the room, tempting me to curl up with a book and a glass of beer (you keep your wine, I'll have beer!) while I work on my organizing goals late into the night. Happy Holidays! What are your holiday traditions? Other than wrapping up last second gifts? I can never escape that one! This will be the year I finally embrace it! 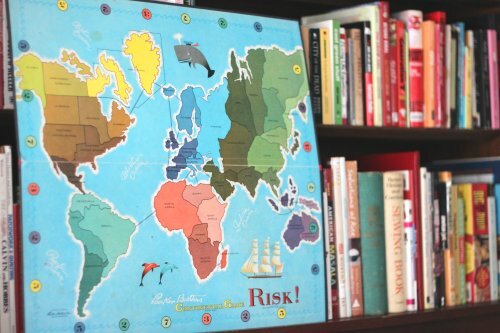 1) This vintage Risk game board still holds a special place in my heart. 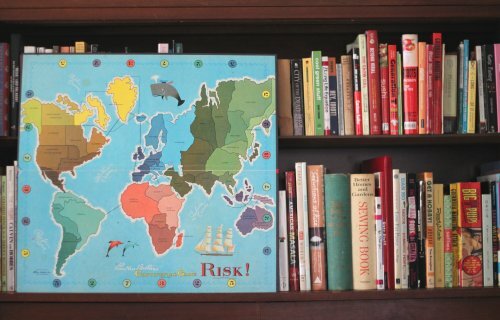 One of my favorite blog posts from this year is about this piece: My Favorite Dumpster Find and a Story of Risk. 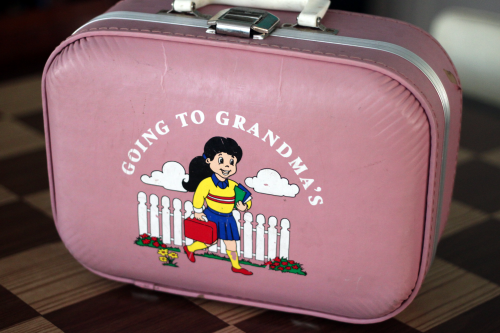 2) I was shocked to find this adorable suitcase in a dumpster behind a thrift store. It's brazenly cute, and the cryptic kid's writing scrawled on the inside only added to it's charm. 3) I Cheated: This entire haul of dumpster dived books is my third favorite. 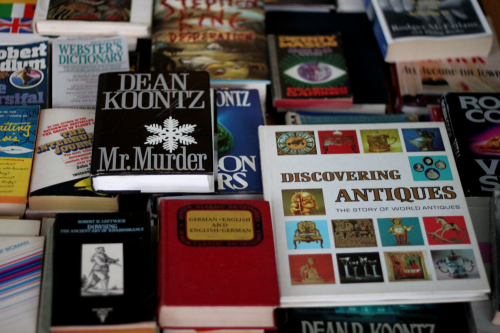 Three books from the Guerrilla Marketing set were in this one haul! They were in the paper recycling bin behind a thrift store. Another question I'm often asked is how frequently I dumpster dive. Very rarely. I've probably only checked the dumpsters about a dozen times this whole year, if that. I'm trying to downsize what I own, not become a hoarder! First, I want to work on organizing what I own. Once that's done, I'll get back to bringing home a selective amount of goodies. Dumpster Divers, Remember: Take what you want, but use what you find! Happy Hunting! 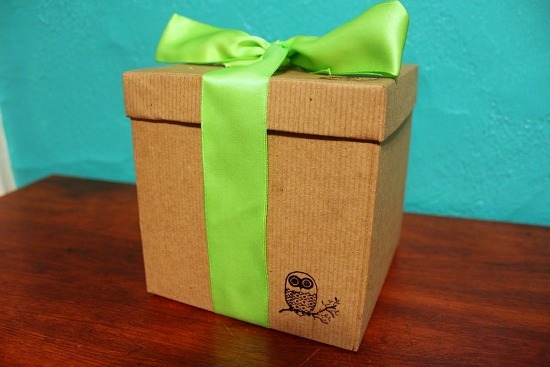 Quick and Easy Gift Wrapping DIY: There's Still Time! 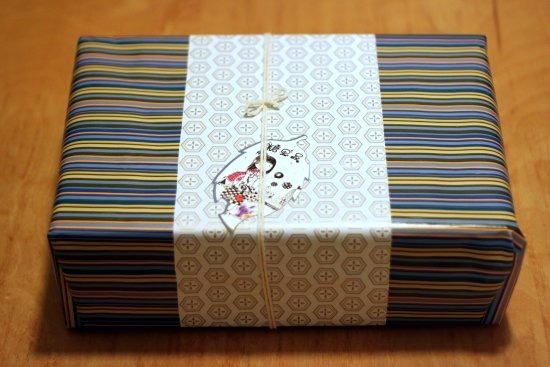 I shared a gift wrapping DIY inspired by packaging I saw in Japan last week. 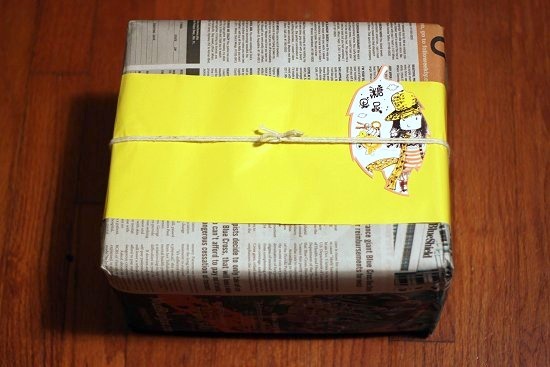 I liked how it came out with the packages wrapped in newspaper. It's a new spin on the thrifty classic that doesn't take much longer than hunting down a newspaper in your house. I was doing product photography for my pals at Old Skool Junk last week and loved these jewelry sets they made. 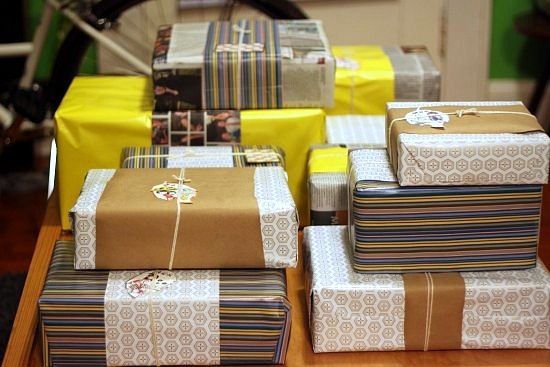 You too could creatively wrap gifts for your friends this way. The boxes were constructed from paper and filled with crinkly paper. Simple enough! Old Skool Junk also made these vintage gift baskets for their booth near mine at Southern Crossing Antique Mall. 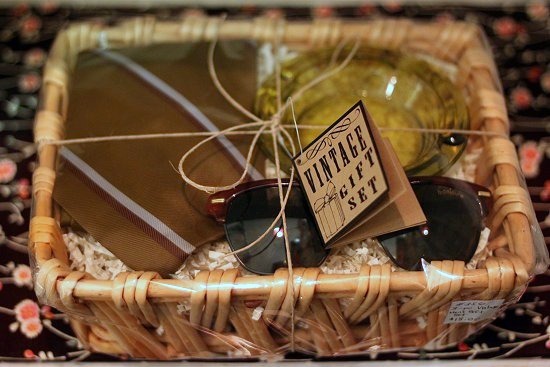 I like the idea of filling vintage baskets with goodies the recipient will love. I didn't get a photo since it sold so fast, but the Old Skool Junk team made a "PBR" basket with ties in PBR colors and cans of beer. Choose a theme and get creative! More Thrifty Ideas: 1) I adore The Elegant Thrifter's Hooch Bags! Filling vintage bags with monopoly money, candy cigarettes, they're equal parts old Hollywood class, thrifty-vintage fun, and kitsch! 2) One of my thrifty Twitter followers @camicoquin said she thrifts for wallets, fills the slots with gift cards, and gives them as gifts. Brilliant! 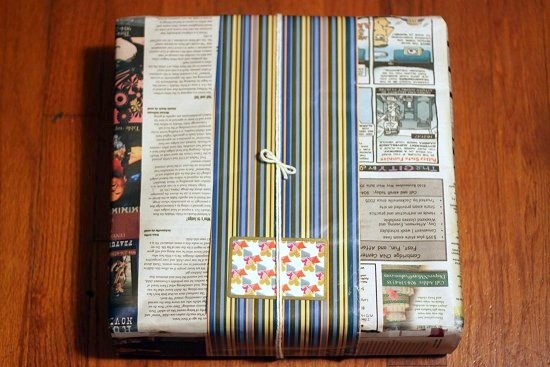 Get creative with your gift wrapping! What are your methods? 1) Being Happy Time Notebook. This has a zipper pouch in the back that would be perfect for holding checks, cash, or miscellenious goods. I see it as a perfect household planner or grocery list book, where you can keep track of what you buy and keep your money budget in the back while shopping. 3) Russian Nesting Doll 2012 Mini Calendar: A tiny, slim calendar, perfect for bags, pockets, or tiny clutches. 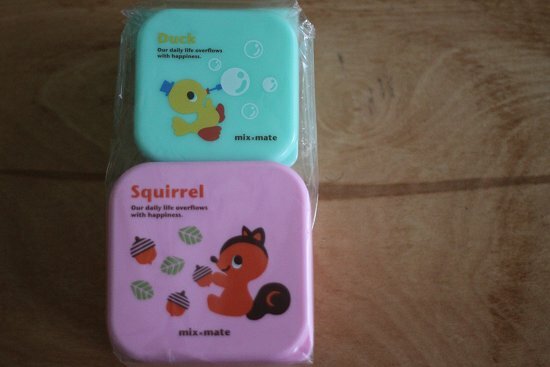 4) Scented Animal Erasers: They're bright, cute, and smell like strawberries. 5) Surprise goodies from Japan! Include your e-mail in the comment so I can contact you if you win! Winning Announcement: The contest winner will be announced Tuesday December 27, 2011 here on Thrift Core. Last week's giveaway winner is commenter #28, Wiilykherr! Thank you, I've sent you an e-mail! Disclosure + Sponsor Thrift Core: Contact me if you'd like to sponsor and/or host a giveaway on Thrift Core. And now I'm off to the hideous shopping mall! I held off until the last second but couldn't find local, hand-crafted, or thrifted gifts for a couple of people on my list. I loved the conversation we had last week about whether it's okay to buy thrifted gifts for the holidays. 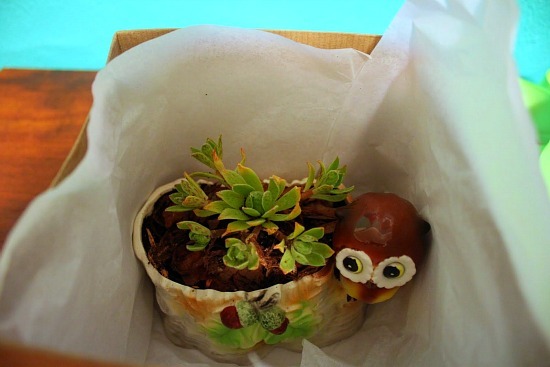 We agree: any gift that won't be utilized or appreciated is junk whether it's new or thrifted. Thinking of the recipient is paramount. Even if we have to endure the mall to give them something special. Still doing some last-minute Christmas shopping? You're not alone, I'm about to leave the house to pick up a few last minute things right now! (We all are!) 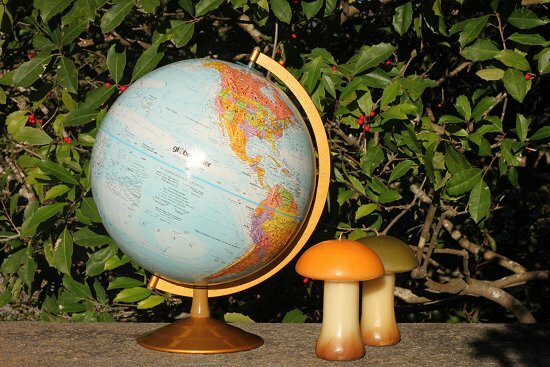 If you want to scoop up unique vintage goodies for the holidays from the Thrift Core Store use the code "ROBOTEXPLOSIONS" for 10% off your entire order from now until the end of the year. I'll be adding new items throughout the week. Feel free to drop me a line if you have any questions. Enjoy! And have a nice weekend. If you're like me, you still have a few more gifts to buy and presents that need wrapping are piling up. No matter how early you start, it's hard to stay ahead during the holiday season! 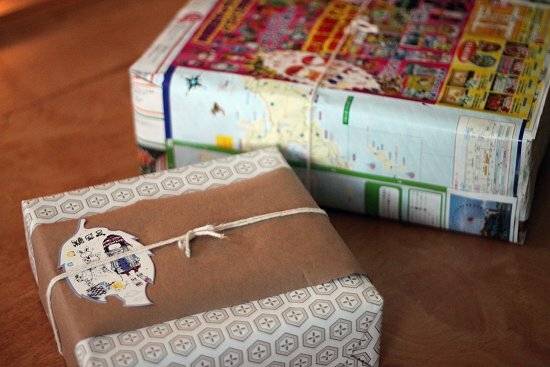 Here are a few thrifty gift wrapping ideas. I used supplies I had on-hand; you likely have these supplies hiding somewhere in your home, too! Don't limit yourself to wrapping paper. Think outside the gift box. Last year I even used pasta and cracker boxes and brown paper bags. 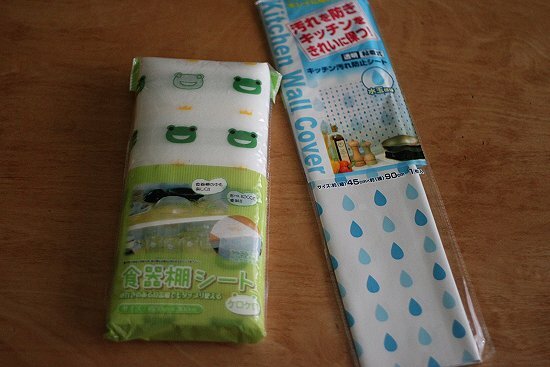 This time I used pages from free shopping catalogs I scooped up in Okinawa. 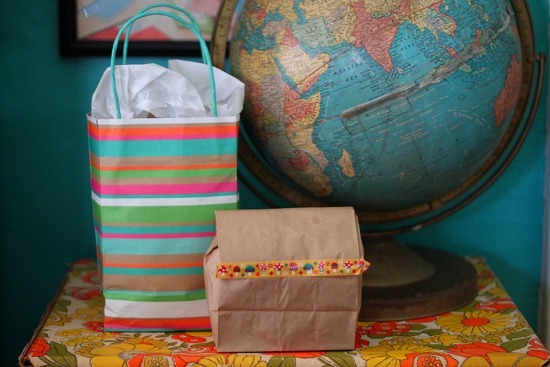 You can use: vintage maps, fabric, magazine pages, retail catalogs, children's book pages, music note pages, construction paper, old calendar pages, school notes, vintages purses/suitcases, or colorful vintage scarves. This year I used vintage playing cards as gift cards! It's getting close to one year since I started selling antiques in a small space I rent at the Southern Crossing Antique Mall. The rent is low, there's a dedicated customer base, and foot traffic is high. It's been a wonderful place to sell vintage and experiment with what customers will respond to when I have a shop of my own one day soon. 1. You have to add more merchandise FOREVER and FOR-ALWAYS. Your hunt never ends. You always have to be on the prowl for fresh new merch to sell. Add weekly thrift hunts to your schedule and make time to add it to your booth as soon as possible. 2. Keep your space fresh, rearrange stock frequently. 3. Experiment: You don't what will sell until you try it. Add items that aren't vintage. 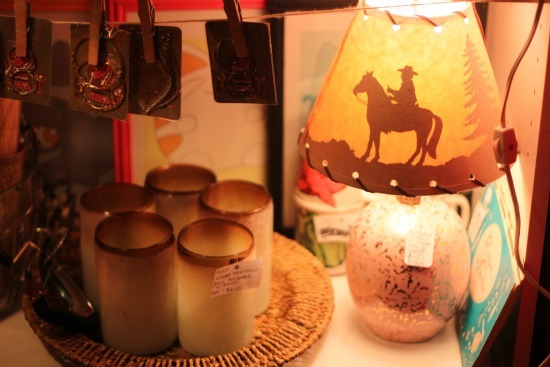 Handmade soaps and crafts can sell very well at antique stores. 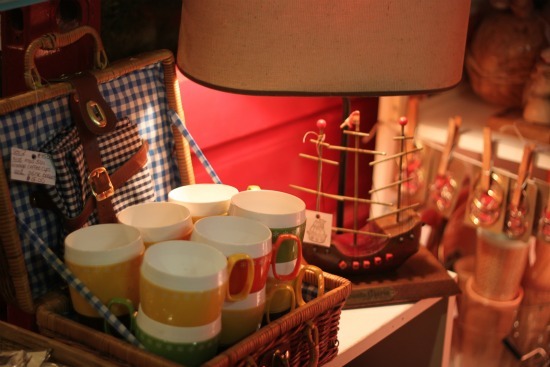 Additionally, add vintage items you thought wouldn't sell, it just might. 4. Small ticket merchandise is your bread and butter. 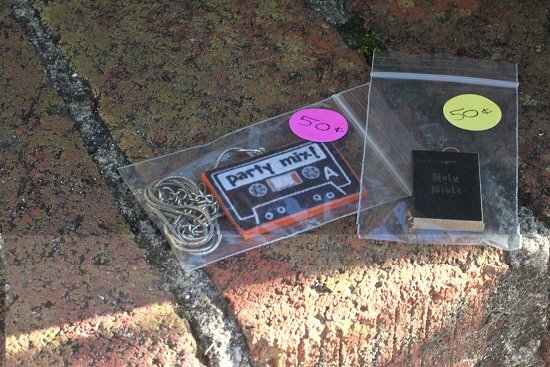 Earrings, small knickknacks, and other small ticket merchandise add up big time. I always strive to create fresh small ticket merch to keep sales going and keep the booth interesting. 5. Customers and sales can be unpredictable. I have to admit, I've been too busy to rearrange and add new stock to my booth as much as I would like. But even when you keep on top of things, customers are unpredictable. Brace yourself, there will be highs and lows! Before I left for vacation I filled my booth with plenty of small ticket merchandise, fresh new items, and additional lighting to brighten up the area. I can't wait to come back and continue to rebrand and restage the space. I'll update with a sales report and let you know if all this extra work really helped in the end! Is It Okay to Give Thrifted Gifts for the Holidays? "I think I would be slightly offended by a thrift store gift..."
"One word. Bedbugs. They’re back in a big way. I do not get anything from thrift, vintage stores that can’t be properly sanitized. Purses fall into that catagory so I wouldn’t be happy with a used handbag no matter how nice." "i guess i’m spoiled but i would be horrified if someone gave me used thrift-shop purses and would probably spend the rest of the day crying (i get a little too upset over poorly-chosen gifts sometimes). my first thought would be if money is that tight that you’re gift shopping in thrift stores instead of proper stores, why couldn’t you have gotten something less expensive but new?" I love to give and receive gifts from the thrift store. Who wants an ordinary item anyone can get from a retail chain when you can have something unique and thoughtful from the thrift? It came with extra effort, someone had to ambitiously hunt down that item for you! Presentation is key...when you give a gift from the thrift, think of presentation. Don't gift an item with unflattering chips or dents. Display it nicely; details count. Think a vintage tin with homemade cookies inside, wrapped in a velvet bow, or a vintage planter filled with poinsettia flowers. 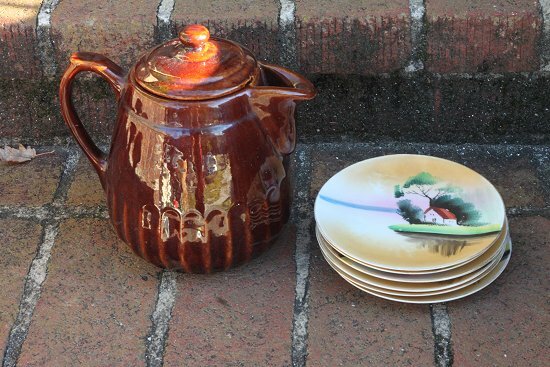 With beguiling presentation, even die-hard thrift store haters will overlook the gift's humble, inexpensive origins. And if your friends are mad that you didn't spend enough on them, find new friends! 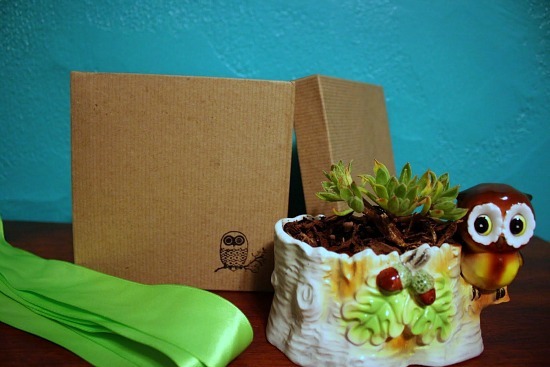 Do This: Check out The Elegant Thrifter for gift-giving inspiration. 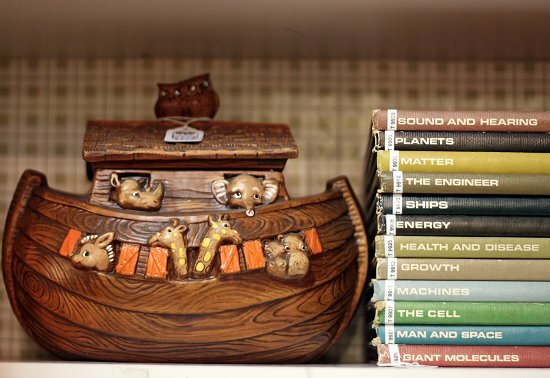 His Gift of Thrift posts display creative presentation ideas and remarkable thoughtfulness! Then check The Non-Consumer Advocate. 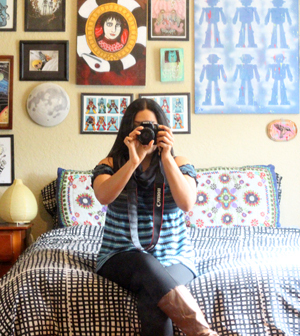 Katy gives thrifted gifts and thrifty gift ideas, Viva La Résistance! Bonus: Last year I wrote up an Ultimate Holiday Gift Guide of thrifty and useful gifts. 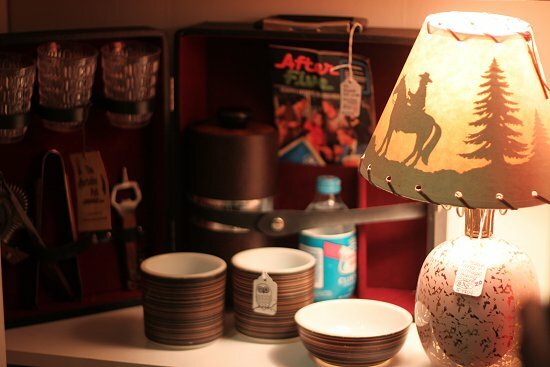 Is it okay to buy gifts from the thrift store? Where do you draw the line? 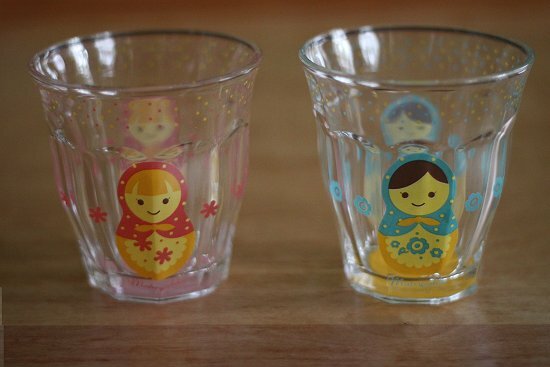 Two Russian nesting doll glasses, one in pink and one in blue. The frog print is for lining your kitchen shelves and drawers. The raindrop print material acts as a protective back splash; stick behind your stove to protect the walls from grease and smoke. I'm sure you could find creative uses for this outside of the kitchen, too! These cute little "snack-sized" bento boxes are perfect for keeping goodies to graze on in your purse, like broccoli or baby tomatoes and hummus. 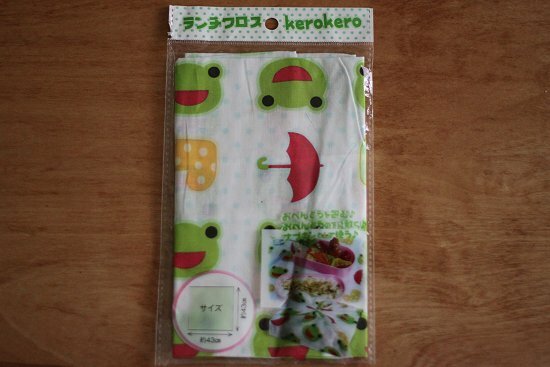 And don't forget your cute frog cloth to wrap up your bento box securely! Leave a comment on this post and tell me: What content would you like to see more of on Thrift Core? More DIYS? Skin care? Informative posts? Thrifting tips? Blog tips? Thrifty interior design? Recipes? 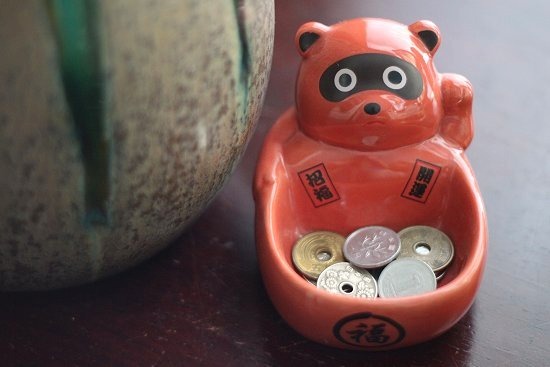 Saving-Money tips? Video content? Outfits posts? ALL things thrifty? I'm planning content for the new year and I need your help, so please be honest! Winning Announcement: The contest winner will be announced Tuesday December 20, 2011 here on Thrift Core. Last week's giveaway winner is commenter #12, Traci! Thank you, I've sent you an e-mail! To get back into work-mode, the first thing I did when I arrived in Florida was hit the thrifts. Well, after accidentally sleeping through all of Saturday and waking up at 5PM thinking it was 5AM; jet lag! 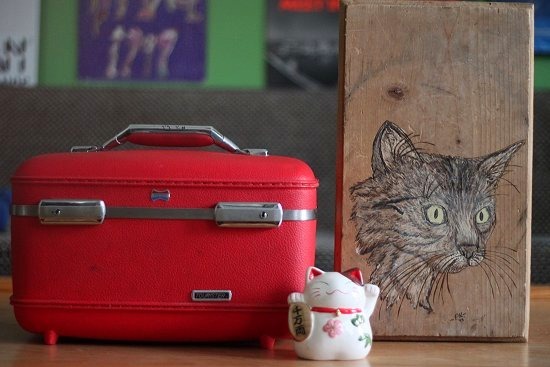 I'm serious about downsizing and accomplishing my Twelve Before 2012 list, so I purchased a mere two items at two dollars each; kitschy kitty art on wood and a cherry red American Tourister suitcase. The cute maneki neko figurine is from a 100 yen store. 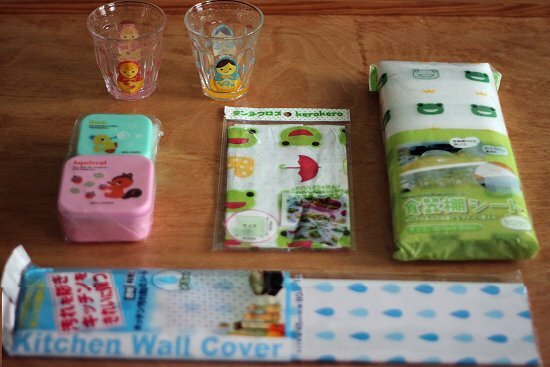 Speaking of 100 yen stores, I have a few more finds to show. 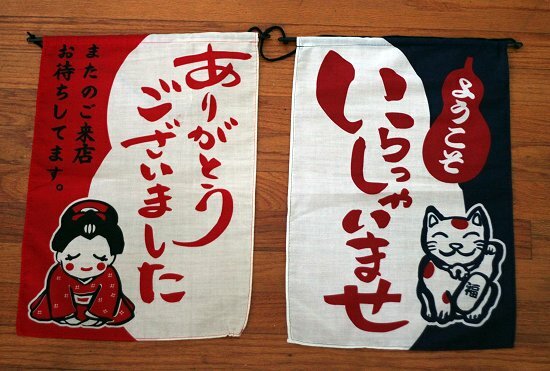 I scooped up these two banners for my kitchen. I remember seeing ones simular to these at an anime con so I was happy to purchase these straight from the source for less. This is one of my few purchases outside of the 100 yen store. 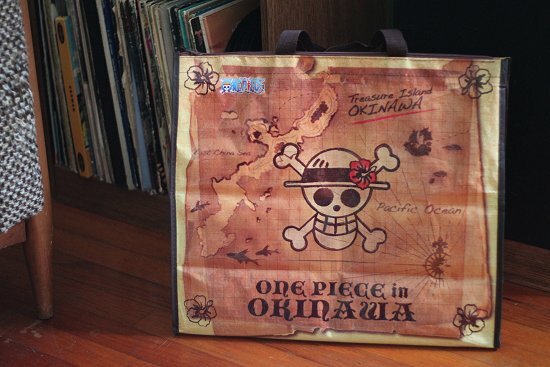 These ubiquitous bags, featuring art from the popular manga One Piece, were purchased by many tourists to carry souvenirs. The 2nd most popular bag I saw tourists toting featured Hello Kitty in Shisha (Okinawan dragon-dog) costumes. The bag will be my go-to flea market shopping bag. 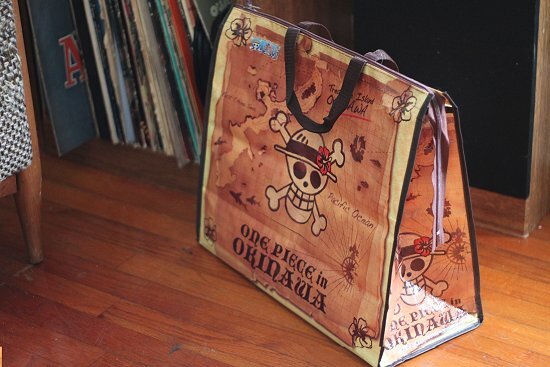 I love One Piece and it's a sturdy bag, it's carried a lot of weight for me across the globe already! I'm surprised the bag hasn't ripped to shreds by now. By the way, don't forget to enter my Maiden Voyage giveaway, the prize is gorgeous! I'll announce the Maiden Voyage giveaway winner and have a special new giveaway up tomorrow.